Carpet requires support and cushioning that needs to be comfortable but resilient enough to continually bounce back after years of continual use. A good quality underlay provides this and more. It can add insulation, level out an uneven floor, reduce carpet movement, which in turn prolongs the life of the carpet. It is important to provide the correct quality underlay to suit the carpet. Underlays also add a feeling of luxury and comfort to a carpet. 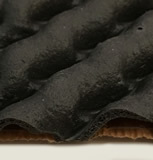 Rubber underlay provides good retention characteristics, and is made with a waffle design, which is then backed. The rubber along with the waffle design has several benefits. It minimises noise, reduce moisture retention, thereby minimising the chances of mould and mildew, and levels out uneven floors. A disadvantage is that it is combustible and may be toxic. It is the basic quality. This is an economical underlay that has good retention characteristics. It is the next in the range. This underlay has better retention characteristics than black, is thicker and provides more luxury underfoot. 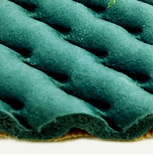 it is the top of the range with a domestic waffle design underlay. This quality has the benefits of extra thickness and durability. It can make a carpet feel very luxurious. Commerical underlay is a solid sheet underlay that is compacted to provide a very firm underlay. The reason for this is, in a commercial application, the carpet needs a firm underlay to minimise movement of the carpet thereby maximising the life of the carpet. Other underlays are available for applications in gymnasiums, dance floors, etc. and is usually a thinner and more compact underlay than typical domestic underlays. This underlay also allows for double stick applications where the underlay is glued to the floor, and the carpet is glued to the underlay. This minimises movement, and thereby increases the life of both the carpet and the underlay in heavy traffic areas. There are thousands of crumbs of foam glued together with a plastic coating adhered to the top to provide a waterproof barrier for the underlay. There are several different grades of bonded foam – ranging from a basic 6mm to 12mm densely compact bonded commercial grade foam. It is combustible and toxic. A solid sheet of foam with a plastic coating adhered to the top provides a waterproof barrier for the underlay. 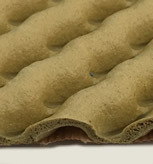 This type is usually more susceptible to flattening compared to the same quality bonded foam. Sheet foam is available from the basic 6mm solid sheet to 12mm high density sheets. 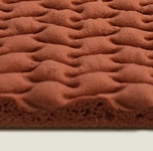 Commercial quality foam underlays are usually thinner and more compact than domestic underlays. This gives the advantage of minimal carpet movement, which increases the life and appearance of carpet. It also allows for double stick applications where the underlay is glued to the floor, and the carpet is glued to the underlay. This minimises the movement of the carpet and underlay, and increases the life of both carpet and underlay in heavy traffic areas. 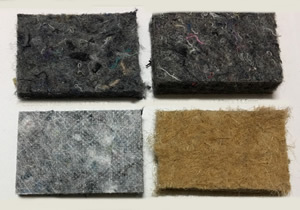 Felt underlay is a natural underlay originally made from animal hair. It now is made from other products as well, such as wool and jute. This underlay is non-toxic and does not support combustion. It is widely used in Government housing due to its natural composition and minimal combustibility.